As the impactor is facing the comet, the back (aft) of the impactor is the part that came up light. The team realized some consequences of the weight loss during a spin balance test when they found that the loss had put the impactor out of balance. It is more important that the impactor be in balance than it is to have the extra weight. 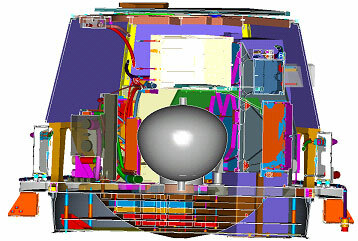 The electronics for the spacecraft are in the back half and the cratering mass is in the front (fore) half. At the end of our answer to this Brain Twister, take a look at the article below by Ray Brown at the University of Maryland. Ray discusses more of the options the team considered. Some were abandoned because they would have affected the spacecraft or caused a re-design effort. If you find you missed the right answer to this Twister, you might find your option discussed in the article. Either way, you are well on your way to thinking like a mission team member! Generally, a mission team is concerned that the spacecraft they build is too heavy to launch and fly. 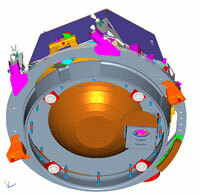 With this mission, the impactor that makes a crater in comet Tempel 1 is specified by design to be 370 kg (820 lbs). So there is already a lot of weight given to that part of the spacecraft. The impactor must be able to aim at an exact place on the comet and stay on target without tumbling or twisting to one side. To do this, the center of its mass* has to be close to the centerline of the impactor and at a certain position along its centerline. When the back to the impactor tested light, it moved the center of mass toward the heavy cratering front instead of keeping it in the center. While a shopping cart is built differently, it's a little like putting too many groceries to one side of the cart than the other and then having it veer toward the heavy side. The team had to decide. If the impactor is light at one end, should you add weight to that end or take weight off somewhere else? The team started with the light aft end and looked at attaching more weight, but none of the options would assure success. So they considered the second option to remove weight from the front (fore) end of the impactor. The front had a set of discs heavy enough to punch a hole in Tempel 1. They couldn't remove the second disc because of the hardware attached but they could remove the first disc and balance out most of the former weight loss. This moved most of the center of balance back to the required centerline position. That may sound fairly simple but two other parts of the impactor at the aft end had to be removed or gain weight to bring back the rest of the balance. Thanks to Jeremy Stober, Impactor Systems Engineer at Ball Aerospace & Technologies Corp.
Mass is a fundamental property of an object measured in kilograms or pounds, but mass and weight are not the same. Weight can be effected by the forces acting on it, such as the fact that a person weighing 100 lbs on Earth, weighs 1/6 that on the Moon. Yet the person has the same mass in both places.